At this stage both your bump and baby are growing nicely. This week is a significant one for your baby as they have developed almost all their intricate body systems. Going forward, they’ll take the rest of the 28 weeks to grow, allowing time for their already developed little systems to mature and function. You’re most likely gearing up for the first big scan, where tests will be done to ensure everything is on track. The fetal assessment will test for any genetic defects or any other health problems you’ll need to be aware of. We know this can seem scary, so be sure to ask as many questions as possible on the day. And just bear in mind that only a very small percentage of pregnancies have issues. 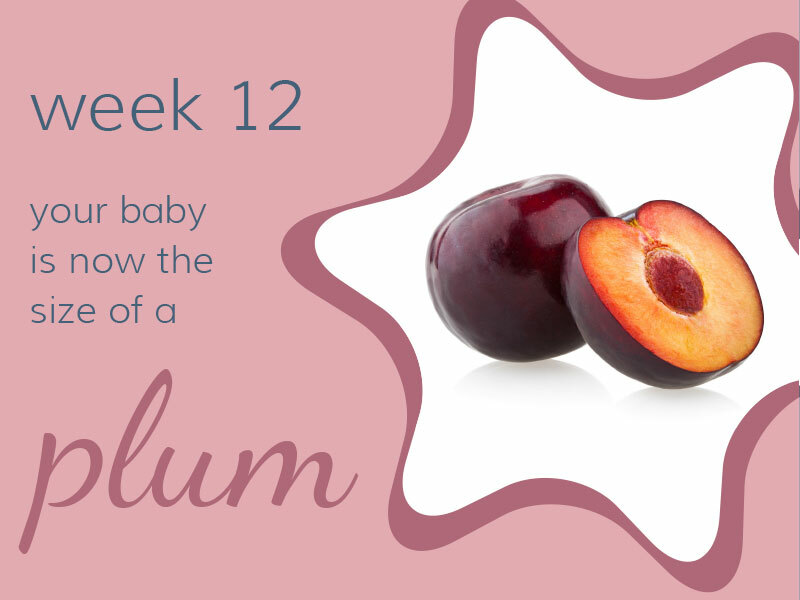 Your little ‘plum’ pudding is weighing 14 grams and almost 5.5cm long from top to bottom. Your baby is looking like a proper little human, their eyes have moved from the sides to the front of the head, and their little ears are now in position. At this stage, reflexes are being fine-tuned and their little brain is also developing rapidly. Fingernails and toenails are also starting to grow. Yay! You’ve just about made it through the first trimester and you’re most likely starting to feel like you have a bit more energy. With your growing uterus moving slightly to the front and centre of your abdomen and away from the pelvis, you may not feel that constant urge to urinate all the time. But don’t get too excited, your old friend progesterone may be a party pooper by causing dizziness and headaches. By the end of this week, you could expect to have gained around 1.5kg. If you haven’t done so already, now would be a good time to book your fetal assessment. This is usually done at around the 12 week mark, and it’s a thorough test to make sure all is well with your little one. The test will screen for certain birth defects, and will also check that the placenta and umbilical cord are functioning properly. Your due date will also be confirmed. Take your partner along, as it’s a wonderful opportunity to see your little one as well as to ask as many questions as possible. Make sure you leave with a decent scan – you’ll spend many months staring at it in amazement. Now would also be a good time to make your announcement to friends and work colleagues before the growing bump makes the announcement for you. This entry was posted in 1st Trimester. Bookmark the permalink.